When I first saw the tweet from PM Sound Effects announcing the release of the library ‘Glitchy Circuits’, I wasn’t sure what to expect, whether it would be an electricity sound effects library, a library full of circuit-bent technology along the lines of ‘the Arduino Collection‘ or something granular full of sounds processed with buffer effects. On downloading the free update that owners of his ‘Everything Bundled’ collection get access to, I got something rather different from all these possibilities. GLITCHY CIRCUITS is a collection of 220 glitch sound effects. Glitchy risers, distorted circuit impacts, mangled & overdriven stutters, sparkly tiny one-shots and more. Since the blurb also says that “All source sounds have been heavily processed with guitar pedals, plugins, recorded through old tape decks and small speakers”, rather than being related to ‘The Arduino Collection’, this library seems more closely related, at least in terms of methodology if not the final sound, to the kind of work composer Mick Gordon produced, as outlined in his seminal presentation for GDC a couple of years ago, particularly in the section that begins approximately 14 minutes in. Both Mick Gordon’s work and the sounds in this library arrive at their finished state through a lot of parallel processing and, crucially, by the use of a lot of analogue gear, which adds noise and tone to the final result. The upshot of this is a lot of pleasingly distorted assets full of punch and replete with squeaks, whistles, whales and growls. Here’s a demo for the library. Many of PMSFX’s libraries have a very tight focus, incorporating lots of variations on a theme. This libraries focus is a little broader, since it comprises several sections – distorted glitches, distorted LFE impacts, drones, swells and buildups and sparkly short glitches. Within each section though, there are still plenty of closely related variations, ideal for game developers and film-makers. You might be forgiven for thinking that glitch-based sound design is one of the easiest areas to work in. Field recordists and sound designers spend their lives trying to make things sound pristine after all and, if you’re going for glitchy, you want dirt, noise, crackle and all the things we work so hard to get rid of. All you need to do, in theory, is bit-crush the heck out of something, record some electromagnetic sources, create some feedback and record it or all of the above and call it done right? These approaches can indeed produce excellent and valuable packs of source material for an end user to manipulate further, but ‘Glitchy Circuits’ goes beyond that. Rather than simply being a toolkit for sound designers to work with, although it could certainly be used as such, this collection offers sounds that are ready to slot straight into your project and demonstrates that it is indeed possible to have a pristine glitch. The underlying principle for this library seems to be “a place for everything and everything in its place”, so that while the sound effects here have plenty of grit and dirt, everything is balanced to avoid excess that could well become ear-fatiguing. What’s more, all the sounds have structure and complexity. Instead of being a batch of field recordings of glitchy chaos, ‘Glitchy Circuits’ is an array of emotive sounds sculpted from glitches, shaped with intent. Some of the distorted glitches, like this one, have a shape that reminds me of the sound my mum’s old auto-wind camera made. Many of the sounds, like good stories, have a clearly defined beginning middle and end and have been post-processed to achieve the best result. For example, as the library description mentions, reverb is used, especially in some of the drones, to provide a sense of space and heighten the mood. Particularly in the LFE impact section, there is use of tremolo and rhythmic stutters that give them a definite shape and purpose, making them ideal as trailer elements or for use in radio/podcast jingles. Here is an example of one such sound in our library. Some of these sounds have a high-tech feel, despite being glitch-based. Sparkly glitches like this one could make good UI elements, while many of the swells evolve in quite complex ways and have tonal elements that convey emotion almost to the extent that they could be used as robot vocalizations. 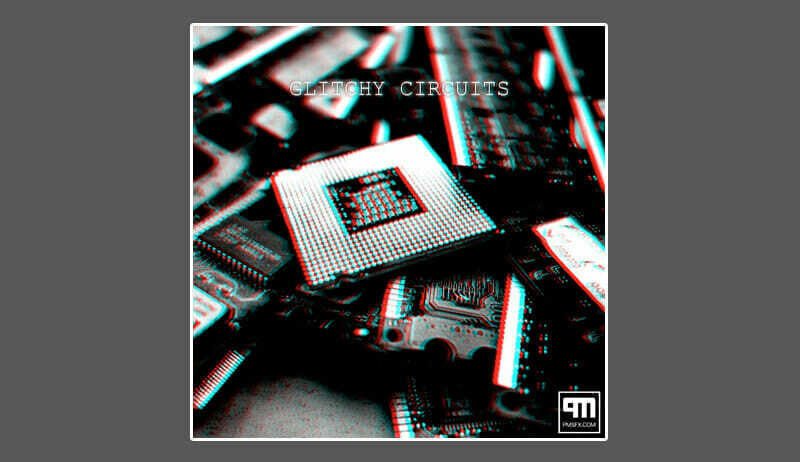 ‘Glitchy Circuits’ is an inspiring and exciting sound library with very high production values. Innovative and versatile, it’s clear that no effort has been spared at any stage to provide users the most bang for buck. Containing everything from understated crackles and squeaks to shrieks of distortion and punchy bass, there’s something here for anyone needing abstract, evocative sound design. Glitchy Circuits’ can be purchased here. For free examples of more work by PMSFX, check out his contributor page here.